This morning, Fanburst announced that they would be shutting down on February 25. 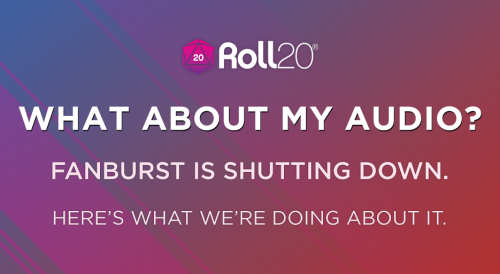 Many Roll20 users rely on Fanburst to provide audio for their games, and we want to keep you informed about our plans to address this sudden change. At the start of January, we announced the Bring Your Own Beat update would give users the ability to upload their own music (“My Audio”) directly to Roll20. In light of today’s news, we have pushed My Audio to the top of our development queue as a standalone feature, but delayed the Jukebox interface changes slightly. My Audio has already been tested on the Development Server and will be ready for all users to upload your own music next week. Meanwhile, Incompetech, BattleBards, and Tabletop Audio will remain available on the Roll20 Jukebox. We’ll continue to provide Fanburst access until the site shuts down on February 25, and we are actively seeking any possible solutions that could make this transition easier for regular Fanburst users. We understand that sound plays an important role in your games and we’ll make sure that you’re able to continue playing with all the tavern music, alien shrieks, and NPC mutters that your heart (and game) desires. Look for the release of My Audio next week to keep your story singing!